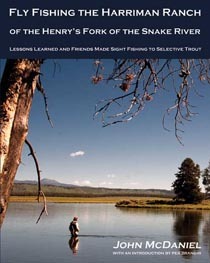 “Fly Fishing the Harriman Ranch of the Henry’s Fork of the Snake River | Lessons Learned and Friends Made Sight Fishing to Selective Trout” – John McDaniel’s long awaited Henry’s Fork book and map is finally available! I had an opportunity to work with John McDaniel’s on his highly anticipated Henry’s Fork ‘ranch’ project. This was a very fascinating project for me and I am humbled to be able to have my work shown with these 2 projects. Plus, working with the well-seasoned Railroad ranch veteran is always a knowledgeable bonus. This book has copious amounts of recorded data information that will always have a useful place on the shelf and the map is highly detailed! If your looking to purchase this book or map just head on over to the TroutHunter eStore [HERE] and grab a copy…. and don’t forget to grab a map while your at it!